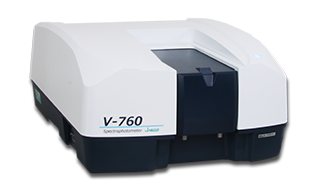 The optical bench in the V-760 UV-visible spectrophotometer utilizes a double monochromator to provide exceptional resolution with extremely low stray light (0.00008%) to assure more precise measurement over the widest photometric range. The V-760 provides excellent sensitivity for diffuse reflectance or transmittance of solid and liquid samples using an integrating sphere. The spectral bandwidth can be set as narrow as 0.1 nm for high resolution measurements, such as gas and vapor phase spectroscopy. Extended photometric linearity up to 8 Abs enables measurement of highly absorbing samples and is also effective for measurements of optical material with transmission characteristics that approach 0 %T. Two user interfaces are available. The Spectra Manager™ II software, the latest version of JASCO's innovative cross-platform spectroscopy software, is now compatible with Windows 7 Pro (32- and 64-bit configurations) and the Windows 8.1 operating systems.